The Vanguard Endeavor ED binocular 8×42 is a top of the range unit that delivers in terms of sharpness as well as clarity, giving remarkable resolutions of color, contrast and magnification. The product features an open bridge design and factors in ergonomics. The viewing angle is wider than most of those binoculars that you may have used before. The premium ED glass is meant to reduce the dispersion of color for better clarity as well as resolution. With the O-ring seal and the nitrogen charge, the binoculars can be used in any environment; extreme temperatures such as winter, rain and high temperatures and is one of the best binoculars for hunting purposes. It is fog proof and waterproof and the casing is one that promotes durability of the binoculars. The Endeavor ED binoculars are one of those pairs of binoculars that any hunter, hiker, mountaineer or all those doing outdoor activities must have. All the viewing features are fantastic. These include the roof system of the prisms; the long eye relief a good close focus makes it to be the binocular to beat. It has the ED glass BaK-4 prisms that are phase coated and are responsible for boosting and enhancement for clear, bright and crisp viewing. The ergonomics are very wonderful ant the barrels are slender as well as easy to handle. The eye relief is 19mm. this is very exceptional and is of great additional benefits to those who use this unit in their outdoor activities to view objects. Those who wear glasses have been the loudest in proclaiming the pros of this unit. This is because of that long eye relief. Without such an eye relief, those wearing glasses are always the most privileged as they may be forced to remove these spectacles. There are those whose condition will not be helped by removing their spectacles hence having binoculars without an eye relief is useless to the. One user was particularly surprised to realize that the Vanguard Endeavor ED Binocular were far much brighter than his Bauer’s which have a magnification of 8 x 56. 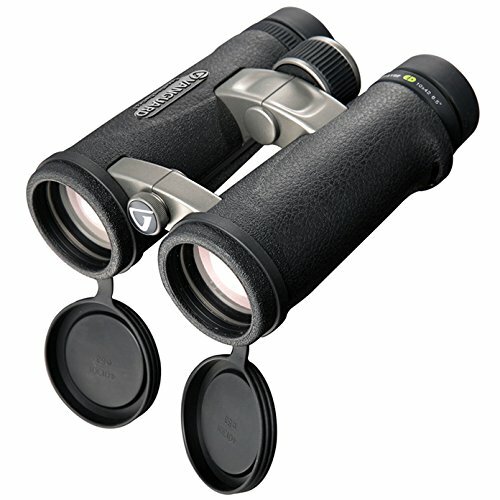 The Bauer’s are more expensive that this Vanguard Endeavor ED Binocular units and the size of glasses are bigger as well yet the latter is more superior to the former. The optics of these units has been designed to give the user real value for their money. The use of the roof prism design makes it far much more superior than those units using the Porro design. Regardless of the pros, there are also some minimal flaws notices on this unit. The main ones are the chromatic aberrations or rather color fringing and pincushion distortion. The distortion present themselves as slight inward image curvatures as you go towards the view’s edge and when the user averts their eyes to look right at it. When looking at high contrast scenes, there is also the possibility of seeing some purple fringing. Such scenes include dark tree branches, white picket fences together with a bright sky among others. Bringing the eyepiece close together or rather narrowing of the binoculars’ angle will reduce this effect. In general, you expect to have among your best outdoor experiences by using the Vanguard Endeavor ED Binocular. Those who have used it to project other species that are far away from them have been able to get the finest detail they needed about that particular species. For instance, if you are out to study the fine details of birds, you will be able to get the best by the use of these units. Bird watching is absolutely one of the main activities that the use of these binoculars is recommended. The best experience when it comes to bird watching is viewing them when they are in motion and not when they are perched on tree branches. However, it’s very difficult to trace the details of these animals while they are in motion. By the use of the Vanguard Endeavor ED Binocular, a pair of binoculars with a wide field of view, you are able to track the birds as well as other animals as they move hence getting the best out of your expeditions. Hunters, gamers, tourists and others are among those recommended to have these binoculars. The Vanguard Endeavor ED Binocular 8×42 is just the best hunting optics device in its category. It has 42mm objective lenses, which are designed with quality edge to edge view. In addition to this, it also has a three-stage twist out eyecups designed to aid in long eye relief not forgetting the position locking diopter ring designed with it. For comfort in handling as well as ease in focus adjustment, the Vanguard Endeavor ED Binocular has an open bridge design that’s with soft rubber armor together with a large easily operated focus adjustment wheel. In addition, it has BaK-4 phase coated prisms, an ED glass together with fully multicoated lenses for enhancing clear view even at long distances. The fact that it is waterproof as well as fog proof makes it convenient for any environment. Try these binoculars on your next hunting expedition and you won’t regret spending your money on it.